A little while ago the Korean translation of THE DOG THAT NINO DIDN'T HAVE was published in South-Korea, at the publishing house of Jiyangsa. This book, made by illustrator Anton Van Hertbruggen and me, was already issued in German, Chinese, Danish, French and American English. The Brazilian version will follow soon. Originally the book was published by De Eenhoorn. 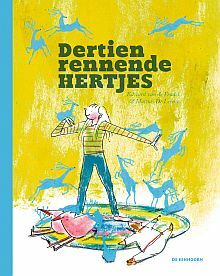 It got several awards, including the 'Gulden Palet' (Netherlands), the 'Boekenpauw' (Belgium), the 'Prix Sorcières' (France) and the Silver Medal of the Society of Illustrators (USA). Rights can be viewed here. But more Korean books are coming. The publishing house of Lime co. bought the Korean rights of THIRTEEN RUNNING DEER, the book that Mattias De Leeuw and I made. This will be out in the fall of 2016 and after the German, Chinese (mainland) and Chinese (Taiwan) it will be the fourth international version. Recently the book was nominated for the German Literature Award. Rights can be checked at De Eenhoorn, here.